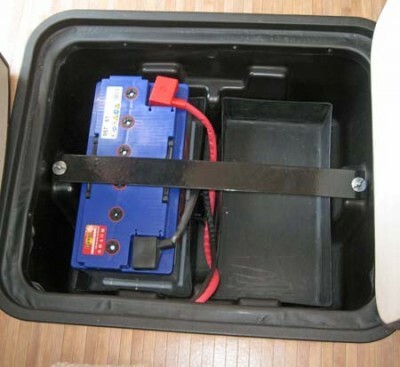 Winter can be a trying time for your motorhome’s leisure battery (or batteries). 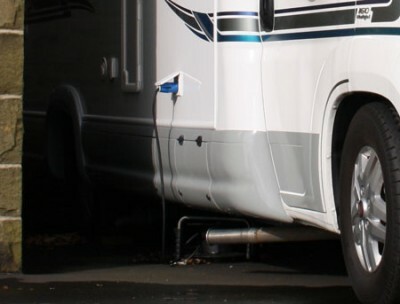 If you’re planning a bit of a rest from your motorhome this winter and you want to go back to a healthy leisure battery, it’s time to start looking after it. Right now! One of the key factors is making sure your battery doesn’t get too cold, because that’s when performance really can deteriorate. Location can be key – most professionally converted motorhomes have in-board locations for their leisure batteries, where it’s hardest for the extremes of cold to get at them – it’s those with external access battery boxes than can be most vulnerable. That’s just one reason why best advice for anyone not using their motorhome in the winter is to disconnect the leisure battery and store it somewhere dry indoors (note, also, it’s a myth that you shouldn’t keep a leisure battery on a concrete floor – there is nothing to prove such a location speeds up the rate of discharge). Only do this however, if removing the battery doesn’t affect the performance of any key security fittings, such as tracking devices or alarm systems. That depends if these devices power from the leisure battery or not. One consideration is to fit an intelligent charger. Such a fitting works effectively all year round, of course. Through winter, you can keep your leisure battery connected and, because intelligent chargers are constantly monitoring, it means there’s no chance of over-charging. For many, this is the ideal scenario. Key names to look for include Automate, CTEK, NDF and Sterling. To be clear, leisure batteries operate very differently to the similar-looking battery that is used to start your motorhome’s engine, which needs to supply power in an instant burst. Deep-cycle leisure batteries provide their power over long periods, so the cycle of discharging/charging is longer, too. A typical leisure battery is the lead-acid type and, as such, will self-discharge, to a greater or lesser extent depending on make, age etc. You need to be able to keep any eye on electrolyte levels, and top up as necessary. When a battery is discharged, it will start to deteriorate. So, it should always be kept warm, comfortable and well fed… with electricity. Other types include AGM (for Absorbent Glass Mat, a form of matting between the plates that filters the sulphuric acid inside a battery, making it more resilient in use) or Gel – a format that means no free-flowing liquid and less gassing. Most recently, lithium batteries have come to the fore. Ideally suited to owners who use their vehicles “off-grid” (i.e. away from a campsites and other sources of mains charging), these don’t self-discharge, are truly maintenance-free, and work particularly well in conjunction with an inverter. The capacity of a leisure battery is measured in amp hours (Ah). Any quoted figure will be at an ambient temperature of 25degC. As a guide, for every one degree below this, the battery’s Ah will fall by one per cent. In response to concerns that too many suppliers were suggesting their batteries were suitable for leisure vehicle use, trade body the National Caravan Council introduced a Verified Leisure Battery Scheme. 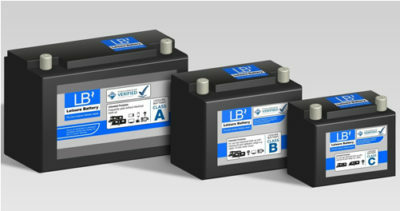 It categorises leisure batteries as: A, for frequent use away from a mains charging source; B, for frequent users, who also have access to mains hook-ups; or C, lower-capacity batteries whose main use is for short periods. You can find out more here: http://www.thencc.org.uk/our_schemes/ncc_verified_leisure_battery_scheme.aspx. Always keep your battery fully charged, even when not in use. When not in use, store in a cool environment connected to an appropriate charger. Check your motorhome for appliances that draw a constant charge from the leisure battery, e.g. a tracking system or alarm, as you will need to counter this draw with a constant re-charge to maintain the battery and you won’t be able to remove your leisure battery. Never over-discharge your battery. A battery is fully discharged when the load voltage is 11.70V – this means charge immediately! Never rely on an automotive alternator only – it may reduce battery life. Worth knowing, also, is these days some base vehicles have “smart” alternators, which may not fully charge a leisure battery. As long as it has access to daylight through the winter, a solar panel can keep your leisure battery charged. Beware of over-charging, however, particularly if your panel has a cheap regulator. Overcharging can be just as bad for your leisure battery as undercharging. As a general rule, never allow your leisure battery to discharge below 50 per cent of its capacity. Performance will deteriorate with age. A typical leisure battery can last as little as five years. Winter is often the time when you find out how good your leisure battery actually is. 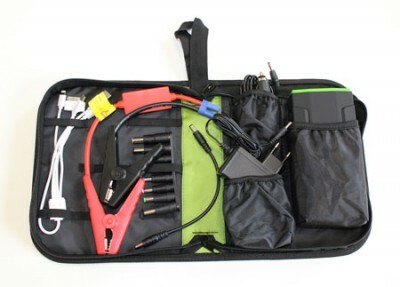 Ideally, use a leisure battery charger rather than a standard vehicle unit. Save your pennies. If you rely almost solely on mains hook-up whilst you’re touring, you don’t actually need a top quality leisure battery. 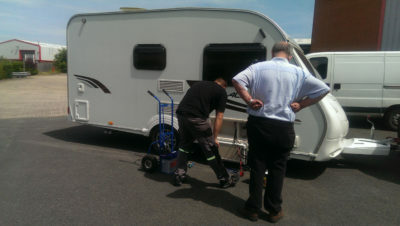 Regular servicing of the habitational aspects of your motorhome will include assessments of the leisure battery (or batteries, if you have more than one). Got any advice on looking after your leisure battery this winter to pass on to others? Feel free to add your comments below. A leisure battery and a starter battery have to perform different functions and therefore operate in different ways. We don’t believe there’s a battery that is good for both starting an engine and running appliances. Hi what great help and advice you have answered many of my questions regarding my motor home batteries . I like others intend to put an extra solar panel onto my auto trail as soon as I get a mild day . Thanks Andrew. Glad you found our advice helpful. Useful. 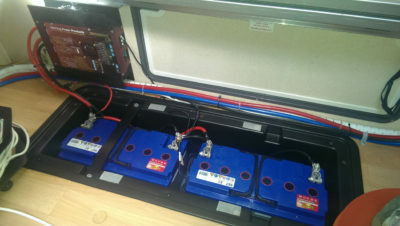 Our two leisure batteries are be in replaced today along with the 12v fridge for a 3 way. Trust this ends our lack of evening power for lights, Tv etc. Since I started using a solar panel 4 motorhomes (and 20 years) ago I have never experienced a flat battery. The first one I purchased was a 50W panel that I fitted to the roof of the RV and simply wired it to a 2-way switch, the outputs being connected to the engine battery and the house batteries. Due to the low power of the solar panel, and the reduced presence of strong sunlight in the UK, it didn’t need a charge controller. Our next RV already had a 120W solar panel fitted to the roof and wired to the house batteries via a Fox solar charge controller. I fitted a Battery-master and this provided excess charge to the engine batteries. Our subsequent RV had a 180W solar panel installed at point of purchase with a US version of the Battery-master and was regulated via a proprietary solar charge controller. When we replaced that RV with our current one I fitted two 100W solar panels to the roof regulated by a top-end MPPT solar charge controller. The vehicle came equipped with a Battery-master. As I said I have never experienced a flat battery scenario in twenty years. I totally believe in solar panels as we spend a lot of time “dry” camping in fields at Steam rallies and Vintage Transport shows. Also, I do check the electrolyte levels regularly and top up with de-ionised water as necessary. Thanks Neal – that’s really helpful. I too had a problem Yuasa battery on my Elddis Accordo 125 and had to change it, Halfords had an offer on their leisure battery. I lay my motorhome up for 6 months of the winter and installed a flexible 100w solar panel which I stuck flat to the roof. It keeps the leisure battery topped up and I run a lead from the charge controller to the engine battery in the passenger footwell to keep the electronics and tracker working. THIS WAS LESS THAN QUOTE FOR DEALER TO PERFORM TASK! Great little bit on batteries for motorhomesale, many thanks. I had many problems with the Yuasa battery and charging system on my new Elddis Accordo 125. On one occasion the battery overheated and bubbled when connected to the mains and the internal charger unit failed. I took advice and went for a superior Banner battery which has been fine but the vendor of this advised that a battery needs to be used even during the winter when the van is laid up and so I do this from time to time. 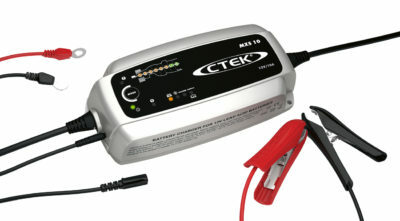 When the van is not in use I use Ctek smart chargers for the leisure battery when I disconnect it from the van’s system and also use one on the engine battery which I simply plug into the permanently connected wired which an AA man kindly installed and which tucks under the seat when not in use. He said it was vital to trickle charge the Peugeot battery when laid up. Good article. I usually declare SORN on my camper from Nov to March to save some road tax and have the van on timed power connection for 4 hours a day from my garage socket. The van is parked in my driveway. It is enough to keep the leisure battery fully charged and is ready and healthy for the new season of camping. Hi I am new to the joys of motor homes – if I leave my vehicle hooked up to mains electricity for the winter will this help the leisure battery? Hi Wayne, it will help charge the battery. A typical motorhome set up is designed to prevent overcharging. Thanks for the positive feedback Martin.